Ertha is a most elegant young mother and doing very well with her litter of six. 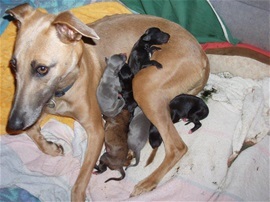 These pups have started life full of vigour, and they have great appetites! Some of these pups will be ready to go to their owners at the end of January. They will be vaccinated and microchipped, checked by our vet and wormed.